The first thing I do when I arrive in Vancouver is to make my way to Vij’s Restaurant. Vikram Vij is a food hero of mine. He runs one of the most hospitable food establishments ANYWHERE. Vij’s and lots of bakeries, eateries, food trucks and energetic activities kept me and my son hustling and happy on a recent visit. Our weekend in this pearl of a city on Canada’s Pacific Rim seemed to sneak up and pass us like a rogue wave. Good thing it started hot and spicy. At Vij’s there’s always a bit of a wait for a table (this will change when they move to a bigger spot on Cambie). I don’t mind. I like the wait. I’ve always found it quite enjoyable and think of it as part of the experience. I install myself in the bar in the back and sip on something cool. 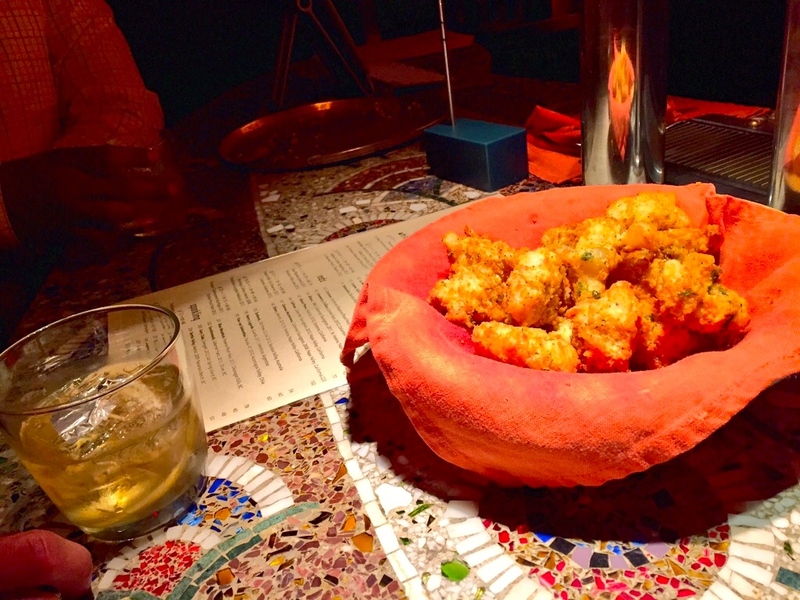 Chaat float past like genies on flying carpets and always seem to appear magically just when you wish for them. These Indian street food snacks are piping hot and complimentary. Crunchy pakoras (fritters) and spicy mho go (cassava) fries are favourites. There’s always an exotic mix of people and a chance to mingle. When seated we order a wide array of food. It changes every time. We just pick whatever the specials are. The lamb popsicles are deservedly famous in their rich fenugreek cream sauce. I have to have the palak paneer because they put WAY MORE ghee than I do in my own version and it makes my mouth water thinking about what richly delicious flavour they achieve. Getting my Vij’s pilgrimage out of the way, I’m open-minded about everything else we’ll do on a visit to Vancouver. 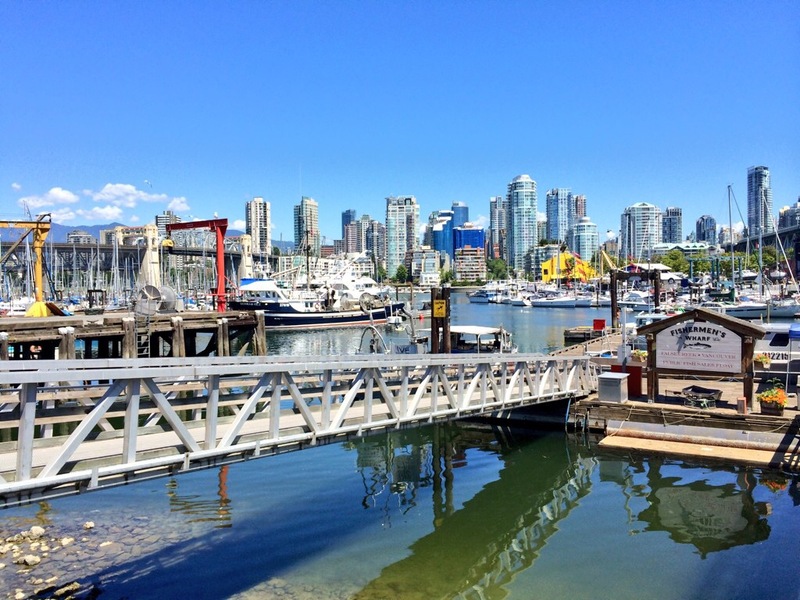 This trip seemed to focus on the “far east” – a side of Vancouver I didn’t know much about. Gastown, Yaletown, Railtown – Vancouver has swallowed several towns whole. These three towns have now morphed into attractive or “up and coming” walkable Vancouver neighbourhoods. They’re clustered in the east end of town and they’re filled with trendy eateries. Gastown is where I met my friend Cristina Coloumbe of Club Intrawest. The company is headquartered there and Cristina and I met to talk about an article I was working on for the Club’s Compass magazine. We walked the cobblestone tree-lined streets so she could show me her favourite eateries and food trucks. Bakeries seemed to be everywhere. 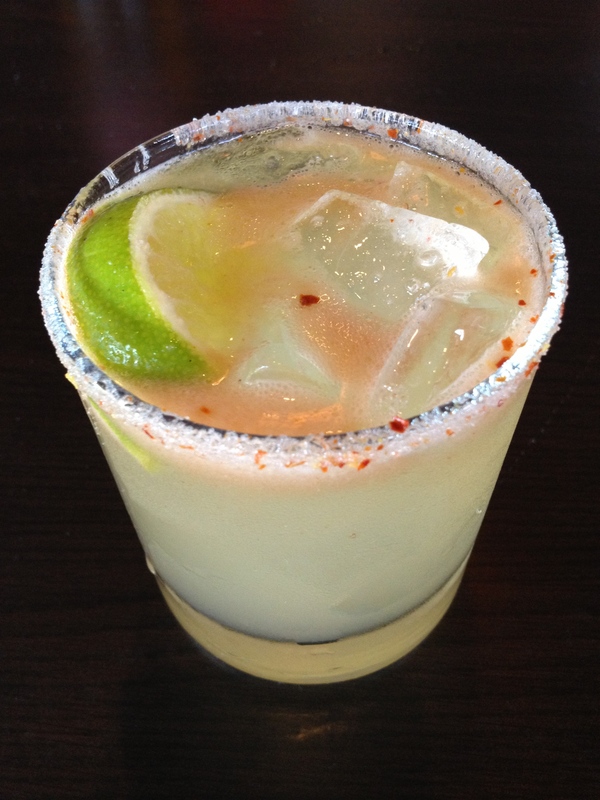 Cristina’s current favourite is one that started in Whistler and recently moved to Gastown. It’s called Purebread. Purebread has a vintage appeal in decor and offerings. I enjoyed a lemony olive oil cake. It was dense and moist with a sweet tart toothsome-ness. Down the street was a Brioche specialty bakery. In Yaletown I had an early Saturday morning meeting Small Victory Bakehouse with terrific coffee and croissants. In Railtown I met a food tour colleague at Cadeaux for late afternoon tea and one of famous baker/owner Eleanor Chow Waterfall’s macarons. In North Vancouver I had a (pre return to the airport) lunch at the very famous Thomas Haas after a Sunday morning hike in Lynn Canyon Park with some North Van friends. I bundled up some of his world class baking supplies and ended up checking my carry on for the flight home. It was worth it. Thomas Haas is in a league of his own but he really needs a bigger place. Back in Gastown, Cristina’s food truck picks looked drool-worthy and were busy with a mix of tourists and local lunchtime regulars. Cristina’s favourites are Japadog, Aruturo’s for Mexican, Mom’s Grilled Cheese, and Fat Duck. One place that started as a food truck in Tofino, opened a more permanent eat-in and take out called Tacofino in Gastown. After a business oriented morning with Christina, it was time for fun with my son. We had lunch at Olympic Torch Plaza at the Tap and Barrel, skipped down the stairs and signed out a couple of bikes from Trevor Linden Fitness. It cost $12/person/hour and we easily cycled the circumference of Stanley Park’s Seawall in that time (They very forgivingly include a 15 minute grace period with no extra charge). Cycling around Stanley Park is a must for me when I’m in Vancouver. The park, the flower gardens, the ocean, the people watching and the exercise recharge my batteries and boost my energy for what’s next. My son just loves to be near the float plane terminal on the waterfront. Another fun thing to do in Vancouver is to splurge on a flight to Victoria for a day. We did that when my son was little. He wanted to be a pilot then and he wants to be one now. Maybe one day, he’ll fly his Mom in one of these amazing aircraft. Other things we’ve done in past visits that my son enjoyed were to visit The Vancouver Acquarium and Science World. Things have changed. Now when we go to Vancouver it is usually a splurge for a concert tour that is not scheduled for a stop in Calgary. We are going to Florence in the Machine in October and we had the delight of being at the World Premier of U2’s Innocence and Experience tour in May. Staying in Club Intrawest’s residences at The Sheraton Vancouver Wall Centre made it an easy walk to Granville Island Market on the Saturday morning of our visit. I love fresh markets. I fantasize about living close enough to walk to one daily. When I’m at Granville Island Market I like to peak into Edible Canada’s shop to see what they’ve scouted in terms of locally made goods. I was impressed they had jams and jellies made by my friends at Joy Road Catering in Penticton. This shows great taste indeed. Strolling the neighbourhoods around Granville Island, I found Go Fish eatery on a previous visit and we now make it a point to catch a fix of fresh fish there at every opportunity I can. 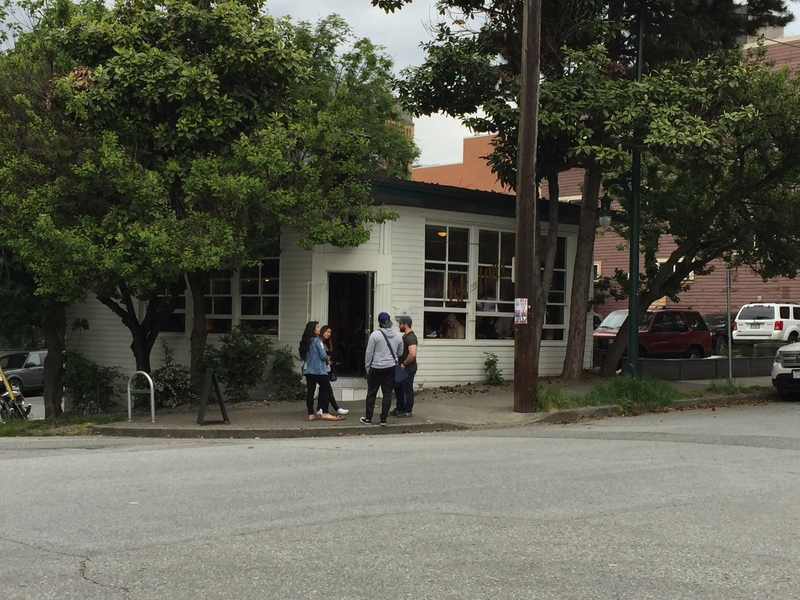 Go Fish is a (intentional) shack of a restaurant right at Fisherman’s Wharf. Fish just doesn’t get fresher than this. You’d think we’d have been too full to continue eating but after we walked the whole way to East Vancouver from Granville Island we built an appetite anew. In East Van’s Railtown district we did a walking and tasting food tour with Off the Eaten Track. It was a fun way to learn more about a part of the city I wouldn’t have found on my own. You can find my full review of that experience in this Trip Advisor Review. Here’s a sneak peak of how enticing the eat and treats on this tour were. Because the rent in this area is not as expensive as “haute Vancouver”, new restaurants can afford to open here. Ask for Luigi had been recently voted the number one place to eat in Vancouver and when we were walking past this cozy little spot – we actually spotted “The Edge” from U2 dining there with his peeps. Of course, we let him be, nice Canadians that we are. Sadly, the trip came to an end all too quickly. Happily, I left armed with a long list of top restaurants picked by the Club Intrawest concierge staff. I’ve already short-listed those picks for my next food foray when I return in October to see Florence and the Machine. Life is good and I’m grateful to my friends at Club Intrawest for all the TLC. Here’s to this shortlist as a way to savour it all when you visit “Van”. I’d also love to hear your favourites so please feel free to leave a comment. Forage – 1300 Robson St. Flying Pig – 1168 Hamilton St. or 102 Water St.
Chambar – 562 Beatty St.
And now, I’ll leave you with a song from Florence and the Machine that often reminds me of my appetite for life – The Drumming Song.